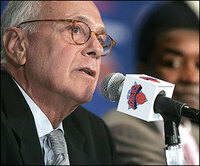 As a quarter season ticket holder, I was pleased to see the Larry Brown era has begun at Madison Square Garden. Given his track record, it probably won’t last very long. But I’ll take a couple years like he gave Detroit!